It is one of my favourite colours. I love it in every shade, from vibrant pinks through to pale pastels. I love vintage pink roses and peonies, pretty pink cardigans and patterned scarves, and love pink gingham and floral fabrics. I am always drawn to the colour pink. Wearing the colour makes me happy, gives me energy and makes me feel uplifted...it makes me smile. I want to make you smile, feel uplifted and inspired by reading my blog. 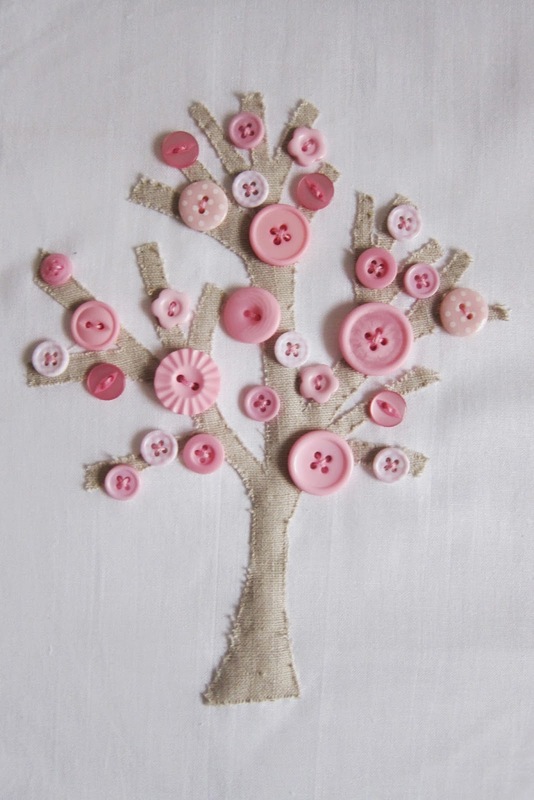 For me a button is a symbol of simple creativity. A practical and useful fastening, it brings things together allowing them to be whole and to work as they were destined to. My blog is about how I'm learning simple crafts and getting creative. I want to talk to you about how I'm learning, show you my practical handmade projects and approaches, with the hope that they will inspire you to bring more creativity into your life. ...After arriving home from a life changing three month trip abroad at the start of 2011, I realised that there was something missing in my life, something I once had, but something that got lost as I went along life's journey... I'd lost my creativity and had left behind my creative hobbies and passions in the years I was studying and working. Just like the tree in the park, my creativity got lost, it became masked from view as other things grew bigger around it...While I was away travelling I decided that I wanted to reinvigorate something in me, to try and find my creativity again. When I came home from my trip I decided that I wanted to plant a new seed in my life and grow a new tree. I wanted to bring new creative handmade passions into my life, to keep learning, growing and developing...I rediscovered my creative passions that I learnt when I was young, and have spent the years since then growing my creative skills, my interests and dedicating time to reflect on how I want to grow and develop. I've become super passionate about photography, gardening, sewing, crochet, knitting, making things for our home, documenting my life, and sharing things that inspire me...I've let myself grow and have dedicated more time to being creative...it has brought me huge happiness. ...I want to continue growing and feeding the tree with my energy and enthusiasm, keeping a close look on how it is growing so I don't ever lose it again...I want to share my creative journey with you, talk about the bumps in the road, the different directions my journey is taking me, and the seasons of change that I experience as I grow my creative passions...I want to continue to grow my skills, to live life to the full, and pass on my thoughts, how-to's and inspirations. I want to pass on a seed to you...to inspire you to grow a life yourself, that's creative, simple, fulfilling and handmade by you.